If you are like me, or the millions of others who rent Orlando vacation homes you do so initially for one or two reasons. One you need more space for that family of yours. You don't enjoy being cooped up in a hotel with all of your kids and your husband, at least I don't. Don't get me wrong, I love my family and like you I think I have the best sons and grandchildren in the world, I just don't want to sleep in the same room as them. The second reason is you are trying to budget your trip more. There's no way around it, vacation homes are cheaper for the larger family or groups traveling together. You aren't going to stay for free, but it beats renting several hotel rooms and you'll be so much more comfortable and happier during your stay. So now that you are renting a fabulous pool home in the Orlando area, you need to know how to get the most out of your money. 1. First thing to do is RELAX. You won't feel compelled to run out and find things to do just to escape your hotel room. You'll love your home so much you'll plan one or two down days just to enjoy your own private pool and lanai. 2. Save money and use the kitchen. Eating out every day is expensive and it plays havoc with your weight. Shop at the local supermarket and pick up food for the week. Eat breakfast before you leave for the parks and plan dinner for when you return. If your home has a grill, or you can rent a grill, you can just throw on a steak or burger when you come back with a salad and your all done. Imagine how much money you saved so you can buy a few extra Mickey Ice Cream bars or Dole Whips at the park. 3. 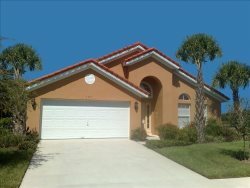 Vacation homes make vacationing with your friends easy and fun. Spend time with your friends and split the cost of the home and food. We always had a jar in the kitchen we'd all put in $20 each after the initial shopping and from that during the week we'd use this money for anything we ran out of. No one ever felt like they did more than their fair share by doing this. 4. Feel like you are at home. Do what makes you feel happy and comfortable. It's your vacation. You should be relaxed and happy. BBQ on the lanai. Swim in the privacy of your home. Soak in your hot tub. Gather outside for cold drinks and great food after an exhausting day in the parks.